Joey Logano started 19th in the No. 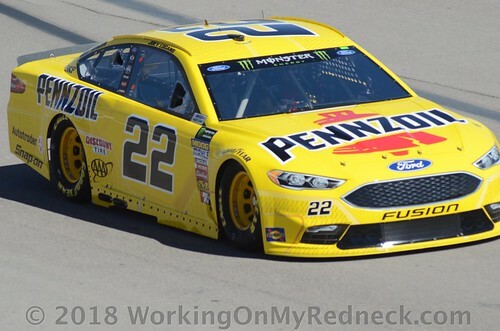 22 Shell-Pennzoil Ford Fusion in the Bass Pro Shops NRA Night Race 500 Saturday night at Bristol Motor Speedway. Logano worked his way into the top-10 following a stellar pit stop under the competition caution at lap 62. 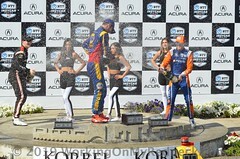 At the end of the first stage, Logano reported he needed additional entry security and forward drive off the corners. Crew chief Todd Gordon called for four tires, air pressure and wedge adjustments on the second stop of the evening. Logano won the segment on lap 250 in thrilling fashion over Chase Elliott, edging his rival to the finish line by mere inches. 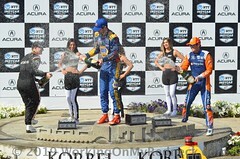 The stage win was Logano’s third of the season. The driver of the No. 22 Shell-Pennzoil Ford Fusion began Stage 3 with the lead and held it until lap 302. Spotter TJ Majors reported that the Shell-Pennzoil Ford looked to be struggling at the exit of Turn 4. Eight laps later Logano reported that he’d lost all his front turn. Gordon made the call to go back on the majority of the adjustments made on the previous stop. 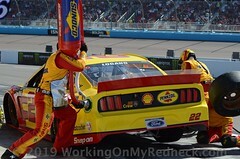 Following the adjustments, Logano ran within the top-five until lap 400 when he reported that once again he lost the front turn on his No. 22 Ford. 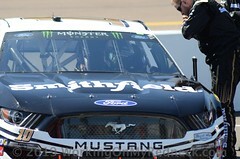 He continued to struggle with front turn, but adjustments made at lap 432 improved the handling of the Shell-Pennzoil Ford. Gordon called Logano to pit road during a caution on lap 472 for another air pressure adjustment, hoping to give the driver some of the fire-off speed back but still maintain the front turn over the final 28 laps. Logano restarted in 10th position on the restart. 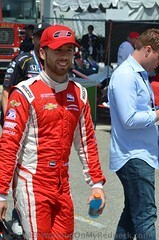 He utilized the high lane and drove through traffic to claim a fourth-place finish. Logano led 95 laps on the night and overcame numerous restarts on the inside line to claim his top-five finish.